I moved house a few months ago and although I managed to unpack most of the boxes within a few days of the move there were still some boxes lingering in the back room. So that got me thinking that if they were still sitting there unpacked after all this time then probably the contents are not very important. I therefore decided that at the weekend I was going to sort through the boxes and get rid of everything that I didn’t absolutely need. Now often when you go through long forgotten boxes you can uncover a lost treasure which will unleash a whole host of nostalgic memories. This was certainly one of those occasions. In the bottom of one of the boxes I found my Troy Stetina guitar books that I had purchased way back in the mid 1990s. The books I found were Heavy Metal Lead Guitar volumes 1 and 2 and Speed Mechanics for Lead Guitar. Now these books, with the accompanying audio tapes, were my guitar learning bible for most of my formative years on the guitar as they were, quite simply, the best teaching material for heavy metal soloing that I could find at the time. 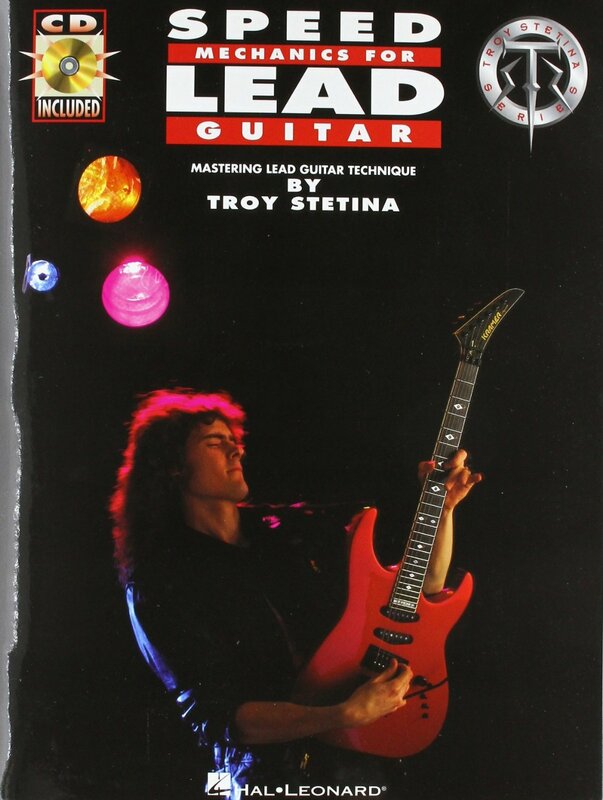 In writing the books it was clear that Troy Stetina wanted to teach all aspects of rock guitar rather than to pass on a few generic riffs and licks. He introduced an understanding of music theory and how this could be used to improve your soloing technique. He also encouraged tapping into your emotions when trying to construct a rhythm piece or solo rather than just trying to rip it up as fast as you could. For me the books represented a turning point in my guitar playing and I think I progressed much further and far faster with just these three books than I had with all the other teaching materials that I had purchased put together. Speed Mechanics for Lead Guitar by Troy Stetina. For those of you who don’t know Troy Stetina is an American rock guitarist who has blazed a trail from the early 1980s and 90s for teaching heavy rock and metal guitar. Born in 1963 Troy was the youngest in a prominent family of Olympic cyclists. Troy himself won a number of cycling medals at a national level but, thankfully for us, cycling was never his real passion. That said he has stated that the competitive side to cycling as well as the focussed training techniques that the sport employed have proved invaluable to his progression on the guitar. His Mother, an opera singer, supported Troy’s interest in music and brought him his first guitar when he was 12 years old. His interest in rock guitar stemmed from the 1970s when he was exposed to the likes of Kiss, Led Zeppelin and Rush, but he was particularly drawn to the lead guitar techniques of Randy Rhoads and Eddie Van Halen. In the 80s Stetina attended the prestigious Wisconsin Conservatory of Music where he ended up as the Director of the Rock Guitar Department. However, he left in the early 1990s to pursue a career as a recording artist. His first books in the Heavy Metal guitar series were published in the late 1980s and it is for these books that Stetina is perhaps best known. Since publishing his first books in the 1980s Troy Stetina has gone onto to sell over 1 million copies of his teaching books, videos and DVDs, which is no small accomplishment in a highly competitive field. In my view his best book is Speed Mechanics for lead guitar which Troy Stetina first published in 1990. It is designed to teach lead guitar techniques, how to practice and encourage evolving creativity. It is split into three sections mechanics, rhythm and creativity. It Includes a rock version of “Flight of the Bumblebee” by Nikolai Rimsky-Korsakov, “Caprice No. 10” by Niccolò Paganini and “Prelude in D” by JS Bach. All of the material will really test your guitar technique to the limits. Sadly for me over the passage of years I have kept the books but have somehow lost the audio tapes that accompanied the books. But I love the books so much I will probably buy new copies just so that I have the audio too. You too can get hold of a copy of Speed Mechanics for Lead Guitar by Troy Stetina from Amazon for under £10.